UPDATE: due to the large entry for the 2018 JD Pentathlon Championships, there will be no day of entries accepted. The online late entry date is midnight Tuesday, June 19. No further entries after this late entry deadline will be accepted. Souvenir Tshirt not guaranteed for late entries. 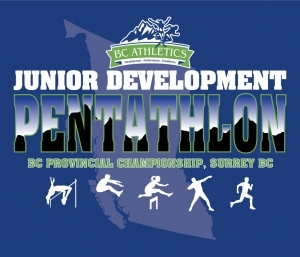 The 2018 BC Junior Development Pentathlon Championships are open to all athletes born 2005 to 2009, males and females. All athletes will compete in 5 events (sprint hurdles, long jump, high jump, shot put and a middle distance run). Points for each event are calculated based on performance. Placing in an event does not play a scoring role in the pentathlon. The top points score overall wins the competition. Coaches meeting at 10:30am sharp. Volunteers need to be at their assigned competition venue by 10:45 at the latest - 10:30 is preferred. Reminder to all participants to contact the meet director with the name(s) of your volunteer(s) so that can be assigned before the meet. All categories begin competition at 11am but athletes do not compete in the 5 events in the same order. All athletes will end their competition with the middle distance run. All categories will be completed by 5pm. Awards will be presented to each group 15-20 minutes following the completion of their last event. BC Athletics Championship medals to the top 3 finishers, BC Athletics Championship ribbons for places 4-8th. It is traditional to have a category group photo at the end of each awards ceremony. NEW this year!! The entry fee includes an exclusive 2018 JD Pentathlon Championships souvenir t-shirt. Entries must be made by the regular deadline of midnight Saturday June 16 to guarantee tshirt size. Late entries may or may not receive a correct sized shirt. See additional questions area to order required size. There will be a Championship Russel hoodie available for purchase as well - $35 These are the classic grey Russel fleece hoodies. Order online at https://bcathletichoodie18.itemorder.com/ Available in Adult and Youth sizes. Orders must be in by Sunday June 10 for delivery at the meet on Saturday June 23.